Delicious, Nutritious, and Easy to Grow! 16 Vitamins, 13 Minerals and Fiber to Aid the Digestive System. Great Source of Niacin and B Vitamins. Includes container, organic soil, and seeds. 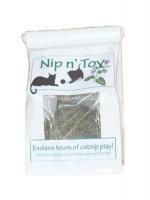 Tipsy Nipâ„¢ Organic Cat Grass is delicious, nutritious, and easy to grow. Along with 16 vitamins and 13 minerals, oat grass adds beneficial dietary fiber and fundamental nutrients that aid the digestive system and keep your cat happy and healthy. Kit ncludes container, organic soil, and organic oat grass seeds. It's normal for cats to chew on grass. Even though they are meat-eaters, they have always eaten grass for a variety of reasons. And if your cat eats a LOT of grass, it may be a sign that the food you are providing him/her does not have enough fiber, and you may want to consider a higher fiber cat food. Speed up Digestion: It's normal for cats to chew on grass. Even though they are meat-eaters, they have always eaten grass for a variety of reasons. And if your cat eats a LOT of grass, it may be a sign that the food you are providing him/her does not have enough fiber. You may want to consider a higher fiber cat food. Induce Vomiting: This may not sound attractive to you and me, but if your cat has eaten something he/she is allergic to, something toxic, or something that just doesn't agree with them, they will eat grass so that the blades will tickle their stomach and induce vomiting. Hours of Fun! Prevent Constipation/Diarrhea: Grass is a great source of fiber, and will help to regulate your cats' digestive system. Coughing Up & Preventing Hairballs: As we all know, cats groom themselves with their tongues, and subsequently swallow a lot of hair and it will make them feel uneasy (like me writing this). Grass will tickle their stomachs and cause them to bring up the hairball right on your bed comforter. Grass can prevent hairballs by providing extra fiber to pass the hair. Avoid Poisonous Houseplants and Chemically-Treated Lawns for a Grass Source.